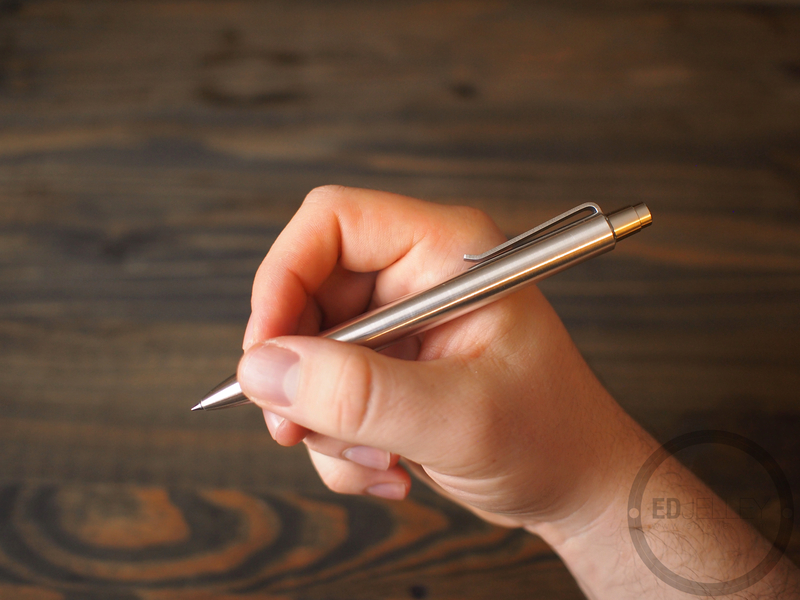 Description: A precision machined pen with a unique lay pattern grip from the people that brought you the EiMIM X, Y, and Z. Point: Variable – The Mover takes G2 style refills, the Shaker takes Parker Style refills. Big thanks to Will over at Tactile Turn for including me in this project’s release! 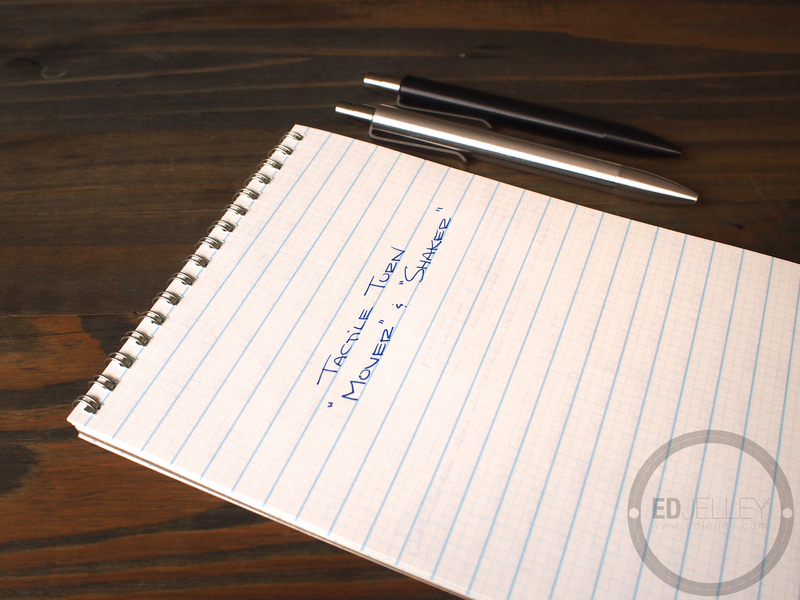 Formerly EiMIM, Tactile Turn has two new offerings to the world of machined pens, the “Mover” and the “Shaker”. These aren’t so much pens as they are precision machined writing instruments. I was blown away by the material, fit and finish of the pens. What sets these apart from the competition is the custom lay pattern grip that gives traditional knurling a run for its money. Wow. Fit and finish here are amazing. The seam in the barrel of the natural finish aluminum Mover is fit so nicely that it is almost impossible to see where the pen screws together. On the anodized black Shaker, the seam is slightly more apparent, but it’s by no means done poorly. Both of the pens feel like tanks. They’re outfitted with a “custom lay grip pattern” that works really, really well. They have a good amount of “bite” and ensure a no-slip grip. Just looking at the grip pattern you can see how precisely that they were machined. Construction on both pens is super solid and I have no doubt that they’ll last a lifetime. I switched over to the smaller Shaker for the Feel section of the handwritten review. Both the Mover and the Shaker are 0.46″ in diameter. 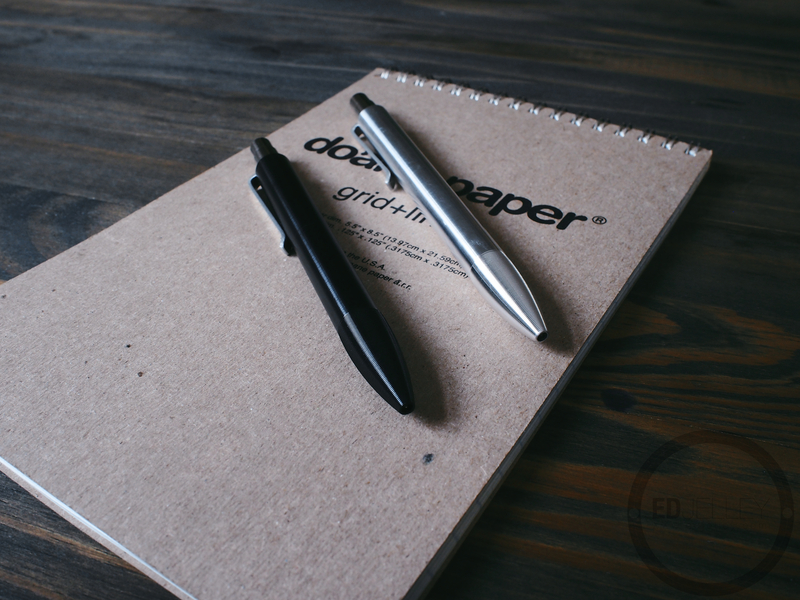 The width is comfortable and the grip tapers nicely to the point of the pen. They’re both comfortable in hand, but I think I prefer the the slightly larger Mover. It’s 0.5″ longer, and I find the balance to be a bit better for me. The Schmidt knock unit is silky smooth and virtually silent. I happen to like a good “CLICK” – similar to the Pilot Vanishing Point, but I guess it’s nice to have something that won’t annoy other people. The click does have a good amount of resistance though. Both pens have a nice weight and balance. What I really like about the Tactile Turn pens are their grip sections. The lay pattern is a series of tightly packed grooves that make an awesome no-slip grip. 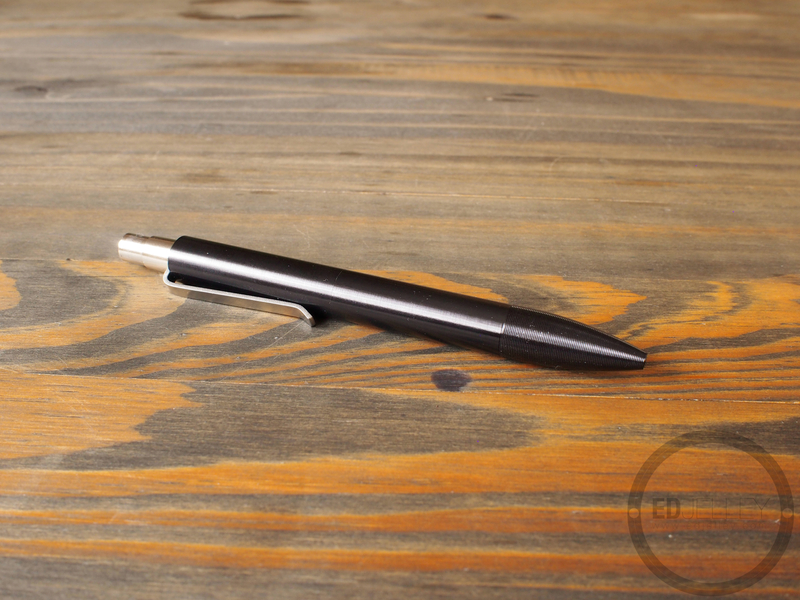 It not only looks great, it’s highly effective at keeping the pen in place. Like I said before, the grip definitely gives knurling a run for it’s money. The writing performance part of this review is going to vary greatly by the type of refill that you put in the pen. 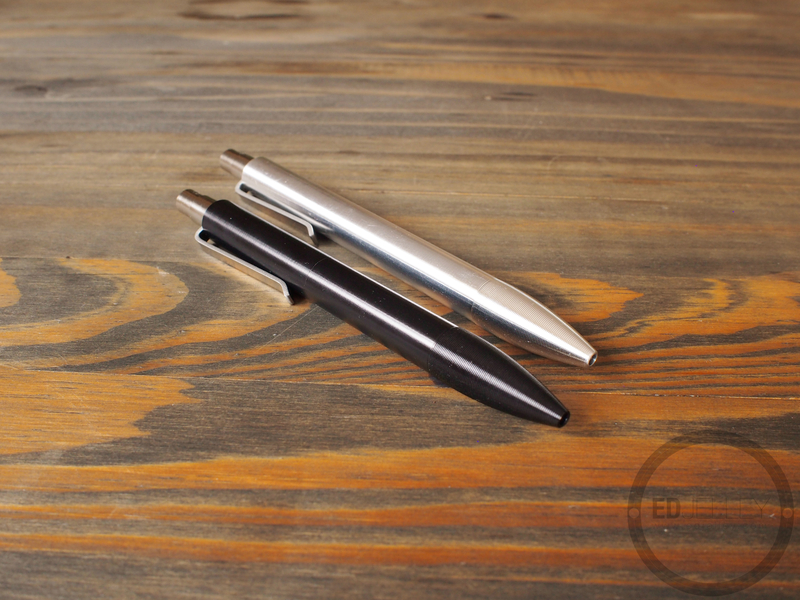 The Mover comes with a black .38mm Pilot G2 refill and the Shaker comes with a Parker-style Fisher Space Pen refill. I’m really liking the .38mm G2, but the Fisher Space pen is just not working for me. I swapped it out for a 0.7mm Parker Gel refill that I use in my Rotring RapidPro. 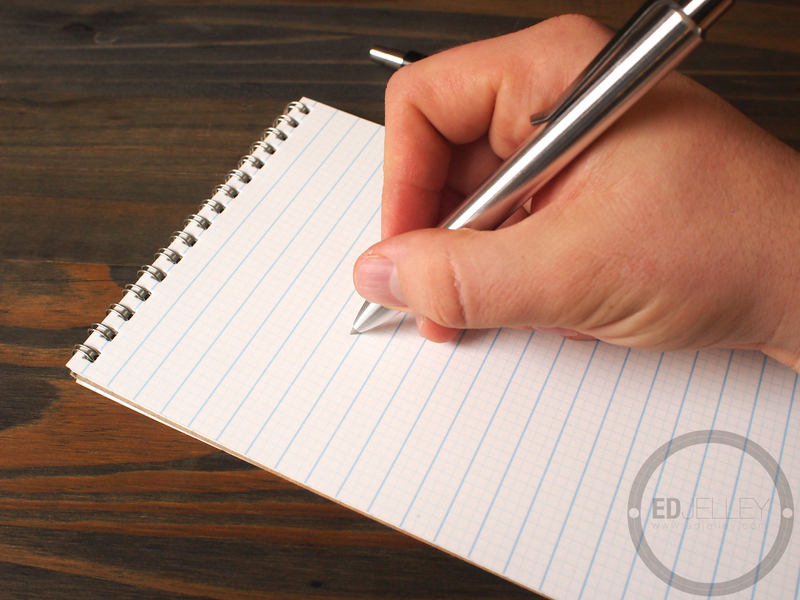 There’s no wiggle at the tip of the pen, and both write well. It’s really going to be hard to go back to a plastic body pen after using these two. 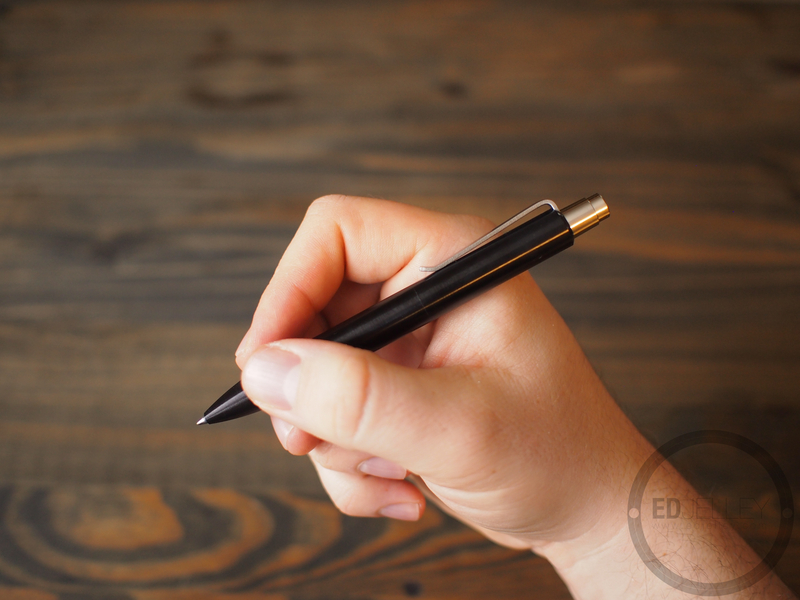 Pen refills confuse me – be sure to do your homework before buying refills if you don’t like the ones that are included. Tactile Turn really killed it with the Mover and the Shaker. Starting at $40 each in a variety of colors, this one is going to be hard to pass up. The awesome build quality and materials, coupled with the reasonable price make the Mover and Shaker great options for those looking for a more permanent pen than a standard plastic bodied throwaway. The grip section really sets these apart from other machined pen offerings, it’s probably my favorite part. 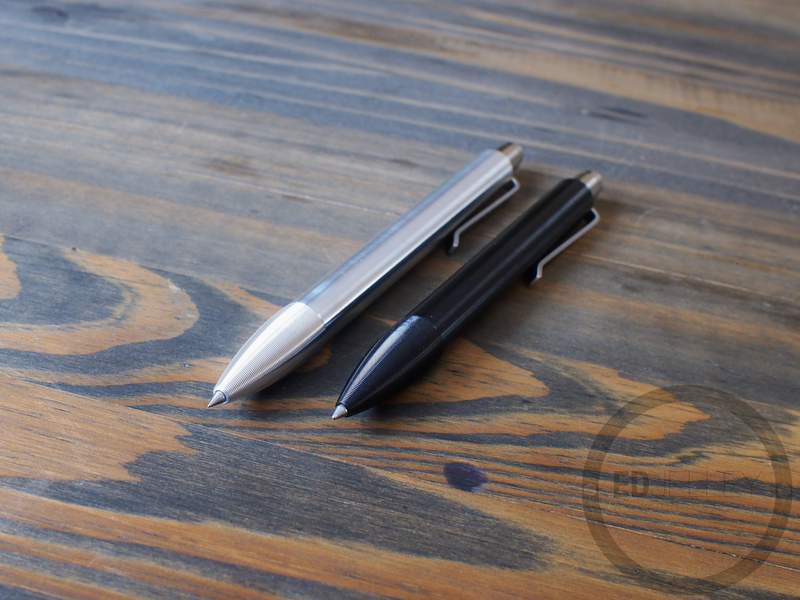 Head over to Kickstarter to help make these pens a reality! It would be a damn shame if they don’t, that’s for sure. 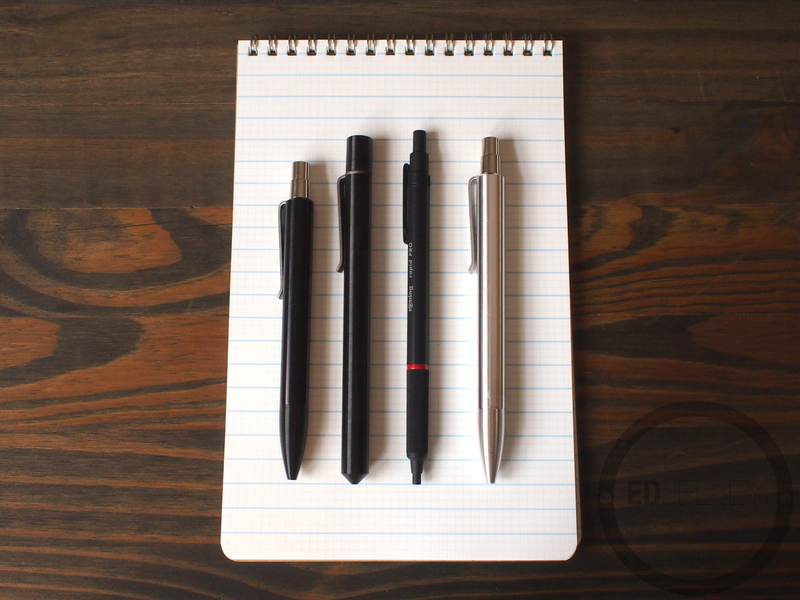 Pocket Notebooks: What does Fountain Pen Friendly really mean? 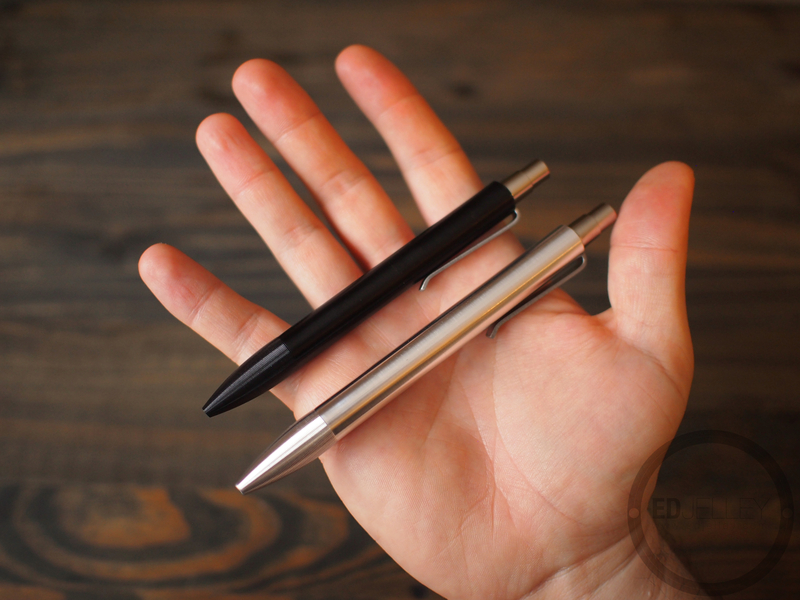 Move great pens from kickstarter … but I just got one from another project. Does the grip section seem durable as its aluminum also? Super durable. They’re built like small, sleek tanks. I have no doubts that they’ll hold up to a beating. Can you do a comparison between this pen and the Retrakt? I don’t have a Retrakt to compare it with! a.) For me the shorter Mover pen would be welcome as I use Parker style refills so the length/versatility of the Retrakt is somewhat lost on myself. I would opt for a shorter Retakt barrel if they ever make one available. b.) The Retrakt has quite a bit of reveal or area above the clip that sticks out of one’s pocket. The Mover/Shaker “solves” this by attaching the clip to the knock/press button. This is only a problem on the Retrakt if one does not like so much showing in one’s pocket. Since all my pens are always unique I generally don’t mind. width of the Retrakt have been very nice (aluminum)… for myself I would not add any knurling or anything to it. I have no remorse about the Retrakt,.. rather it has been really great..the width/shape/grip have made writing a joy. The Mover’s shorter length may appeal to some that use a Parker style refill. The lack of a reveal do make it more elegant and if one thinks they will like the spiral grip it looks like a good alternative to the Retrakt. Awesome, thank you for the comparison! 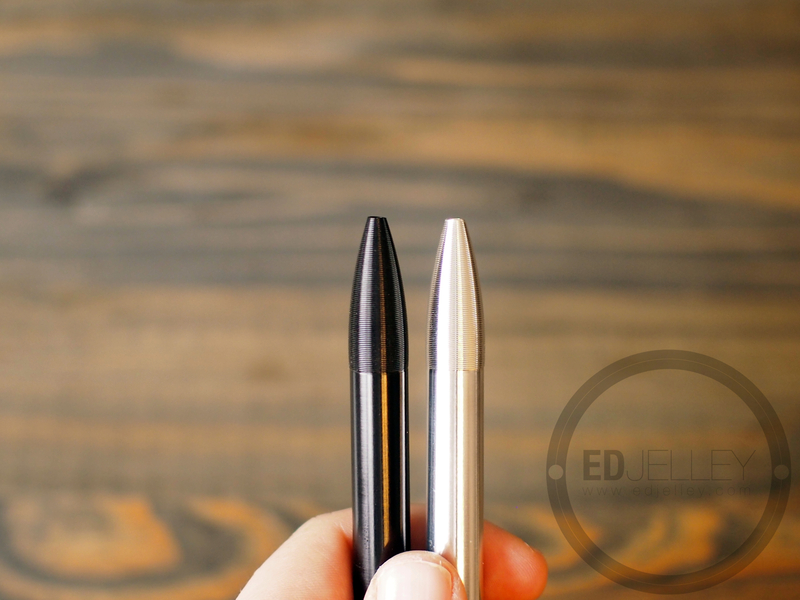 I believe the Shaker is the shorter pen though, if you backed the project and you’re looking for the shorter Parker-style refill, make sure to double check before filling out your survey!